You didn’t think we would miss #NationalChocolateCakeDay, did you? Our plans changed quickly this morning when we found out about this historic holiday! Today we baked a Chocolate Brownie Cake with a Peanut Butter Cookie Crust and Whiskey Caramel Sauce adapted from the multi-talented Paola at Cravings in Amsterdam! 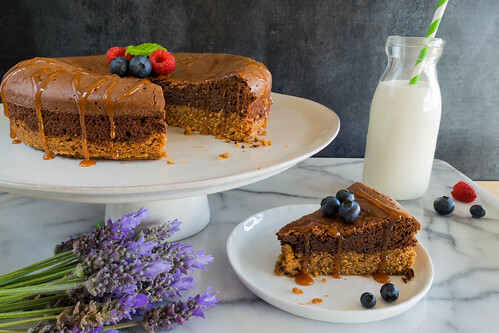 We have been dreaming about this rich and chocolatey, peanut-buttery masterpiece since she posted it a few weeks ago, and today is the day to make that dream a reality! With a crisp peanut butter cookie layer nestled beneath a thick fudgy brownie, this is the ideal treat for any chocolate lover, and the decadent whisky-caramel sauce takes this dessert to another level of sweet indulgence! Be sure to check out Paola’s page for some of the most beautiful food photography we have ever seen, as well as her impressive collection of delicious and creative recipes! Happy National Chocolate Cake Day everyone!! Preheat oven to 350ºF. Line the bottom of an 8-inch springform pan with parchment paper, and set aside. Place the chopped chocolate and butter in the microwave, and cook in 30-second intervals, stirring between each one, until the chocolate is melted and the mixture is smooth. Alternatively, you can place the chopped chocolate and butter in a heatproof bowl, place the bowl over a pan of simmering water, and stir until the chocolate melts. Either way, let the mixture cool briefly to lukewarm. In a medium bowl, combine the sugar, eggs, and egg yolk, and whisk until smooth. Add the melted chocolate mixture and the vanilla, and whisk until smooth. Sift the flour, cocoa, and salt into the bowl, and stir until just combined. Pour the batter over the cookie crust, tapping the pan gently to release any air bubbles. Bake for 25 to 35 minutes, until a toothpick inserted into the center comes out clean, with some crumbs clinging to it. Let cool in the pan until cool enough to handle, then remove the sides, bottom, and parchment paper, and transfer the cake to a plate for serving. Combine the sugar and water in a small saucepan over medium heat. Cook without stirring until the mixture turns amber, about 8 minutes. Turn off heat, then add the cream and vanilla extract. Stir well, then add the whiskey and butter, stirring until smooth and creamy. Transfer caramel to a small bowl or squeeze bottle for serving. Drizzle caramel sauce over the cake, and top with a pinch of sea salt and berries if desired. Add more sauce to each serving, as needed. Enjoy!